Awarding a high-quality certificate of achievement to students who have excelled, in my opinion, is one of the most effective ways to motivate kids. And, I'm sure you'll agree that motivating students is one of the most important things we do as teachers. 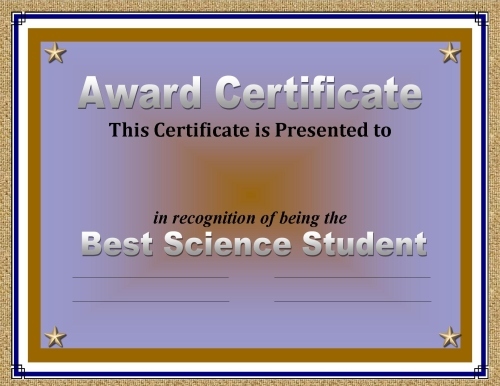 When it comes to certificates of achievement, what I'm finding when I surf the web leaves a lot to be desired. First, most of the sites that offer certificates want you to commit to monthly or annual fees, or worse yet, charge exorbitant amounts of money for what they have to offer. Secondly, most of the available certificates are NOT very sophisticated looking--too long on "cute" and too short on substance and design. Right here on this page, you will find, what I think, are quality certificates of achievement WITHOUT monthly or annual fees. Additionally, these certificates are appropriate for use at any grade level for any subject area. I'm offering 50 high-quality certificates of achievement that your students will truly value. I know that students value these certificates, because in all my years of giving them out, I have NEVER found one of these on the floors ANYWHERE. Which one of these two certificates would you prefer to give to YOUR students? In the unlikely event that you chose certificate #1, please share your thinking with me. Certificate #1 has many shortcomings that I will not insult you by listing here. But, ONE of the most glaring shortcomings is that this certificate was printed predominately in black-and-white. Of course, once they're printed on a mono laser printer, they'll be ALL black, white, and gray. If you printed these "certificates" on standard bond paper and "awarded" them to students, you would find them immediately scattered all over the floors EVERYWHERE in school. The kids simply do not value certificates of this sort. Certificate #2, however, is something that the kids will proudly take home to share with their parents. The 50 RECOGNizers Collection that I'm offering on this page are ALL the same quality as certificate #2 (one of the certificates in this collection). But, as you can imagine, these certificates will not have their maximum impact until they are printed in full color. Color laser printers are far less expensive these days than they used to be. 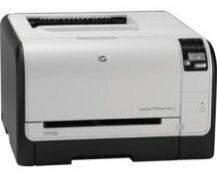 I did a quick search on the web just about an hour ago and found an HP Color LaserJet Pro CP1525nw for $188 (pictured here)--including toner cartridges. No, I am NOT an affiliate marketer for HP. I just thought that you might appreciate the results of my search. By contrast, the first color laser printer that I bought several years ago was an Oki model that cost me nearly $500. Print quality from a color laser printer is excellent. However, the biggest advantage by FAR is the speed. That HP printer I mentioned above spits out 12 full color pages per minute! My Oki only prints 8. Although inkjet printers do a fine job, they are extremely slow. If you had to print 20 certificates for an awards ceremony, it would take you well over an hour of printing time to do so. With a color laser printer those same certificates will print in less than 2 minutes. I know that I'm encouraging you to spend money, but I am quite sure that you will immediately agree that it was money well spent. But, then again, why should you have to spend your own money? Even with the budget crunch that we've been going through recently, I'd be willing to bet that your school principal would find a way to come up with the money for a printer once he/she knows what its intended purpose will be. If you print certificates in full color on regular 20 pound paper, you'll end up with a certificate that curls and shows through from the opposite side. However, if you print a certificate on card stock paper with a weight of 60 to 80 pounds, it will be far more substantial--and far less likely to be balled up or dropped on the floor. Standard-sized card stock paper can easily be obtained at your local office supply store for a relatively inexpensive cost. It's available in multiple colors in both glossy and matte finishes. The glossy finish paper IS more expensive than the matte finish. In my experience, I've found that white paper with a matte finish works exceptionally well. 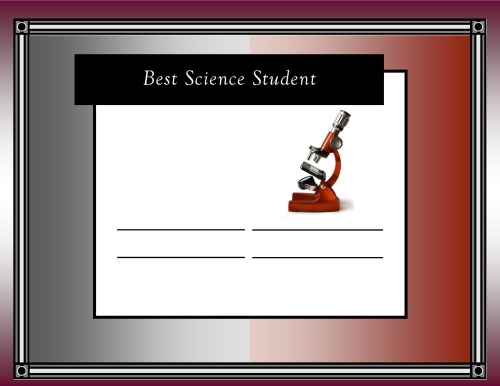 The collection of 50 award certificates recognizing student achievement that I'm offering on this page come in two styles: the clipart version and the gradient version. There are 26 certificates for both of these styles. Yes, I know--that makes 52, not 50. Hey, I'm an English teacher! How can I be expected to count? In addition, I've also included one certificate of each style that allows you to enter the specific award category of your choosing. Here is a listing of the 26 award categories available (so you can read them more clearly). Although you only see 26 titles above, there ARE 52 altogether because there are 2 versions per award. 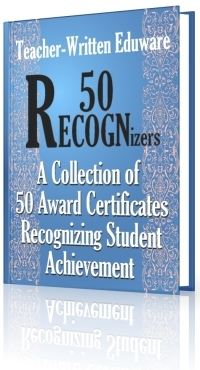 If you would like these 10 award certificates PLUS the other 40 presented on this page, you may want to download the 50 RECOGNizers Collection. 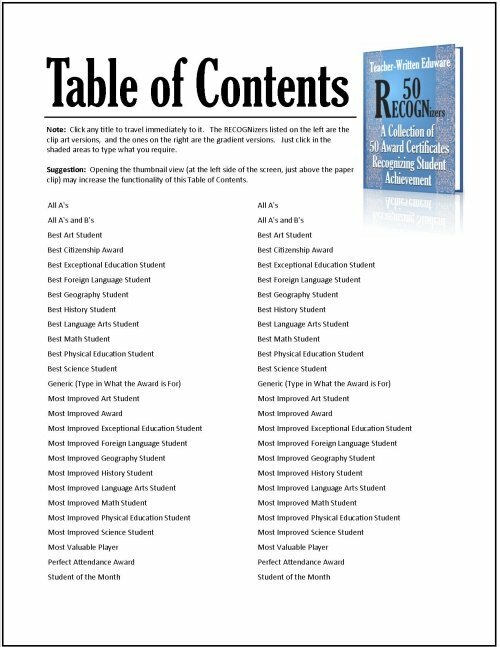 This collection includes ALL 52 PDF award certificates as seen above on this page. It comes with the clickable table of contents that you saw previously for locating specific awards quickly and easily. Whether you use Windows or Mac, these award certificates are ready to print! I'm pretty confident that almost all of us work (or have worked) at schools that provide time and space for end of the year awards. In my case at Twin Lakes, the school auditorium was reserved specifically for each grade level to stage their own awards ceremony. Parents were actively encouraged to attend those ceremonies and witness their sons or daughters being honored. And indeed, they enthusiastically participated. But, why wait until the end of the school year? Find occasions to make a big deal of success. After all, success IS a big deal! 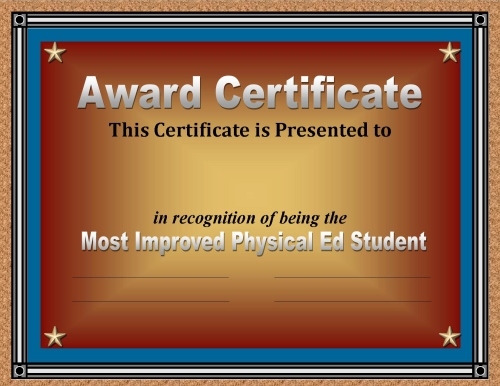 Consider providing award certificates to achievers or students who exhibit improvement at key intervals in the school year--at the end of each grading period, for example, or at any other time that you think would be appropriate. If you don't already do so, you may also want to consider gathering with your team members to choose one male and one female to honor as "Students of the Month." Post their photos in color in a common area--a hallway or a display case for all to see. Give them award certificates as well. 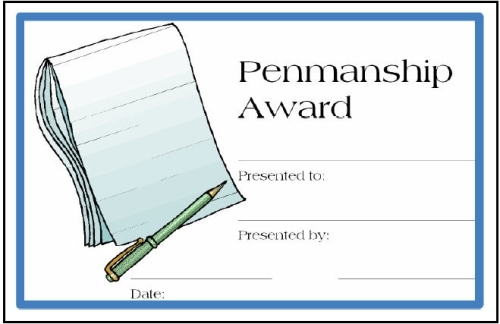 In addition, write a brief paragraph celebrating the achievements of the recipients to be read during the school-wide morning announcements on the day that you award the certificates. Distribute the certificates and congratulate these students in front of their peers. Harness the true power of positive peer pressure. Make success the coolest thing that's happening in your school, and you'll be rewarded for your efforts many, many times over.